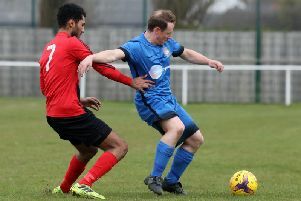 Stewarts & Lloyds produced one of the shock results of the season in Division One of the ChromaSport United Counties League as they left Raunds Town’s promotion hopes hanging by a thread with a 3-2 success at Occupation Road. Michael Byrne put the rock-bottom Foundrymen in front, only for Jamie Russell to equalise on the stroke of half-time. Byrne struck again for the hosts, Ty Clark levelled from penalty spot but S&L secured just their second win of the campaign with a third goal. Potton United are now only one point behind second-placed Raunds with two games in hand after they won 3-0 at Burton Park Wanderers. Rushden & Higham United’s promotion hopes appear to be fading after they lost 1-0 to champions-elect Pinchbeck United. Irchester United bounced back from their midweek defeat at Bugbrooke in emphatic style as they claimed an excellent 5-0 victory at Melton Town thanks to two goals apiece for Ryan Lovell and Josh Burge while Lew Kew added the other. Elsewhere, Thrapston Town were unable to build on their 6-0 success over Huntingdon Town last weekend as they went down 2-1 at Lutterworth Town. Whitworth picked up a good point in the Premier Division and they were only denied all three by a late equaliser as they drew 1-1 with Daventry Town at London Road. The Flourmen went in front but the visitors levelled things up with five minutes to go. Wellingborough Town’s fine run of form came to an end as they were beaten 3-1 at Cogenhoe United. Deven Ellwood scored the Doughboys’ goal. And it was also a bad day for both Desborough Town and Rothwell Corinthians. Ar Tarn were beaten 3-0 at Kirby Muxloe while Corinthians lost 4-0 at title contenders Newport Pagnell Town.